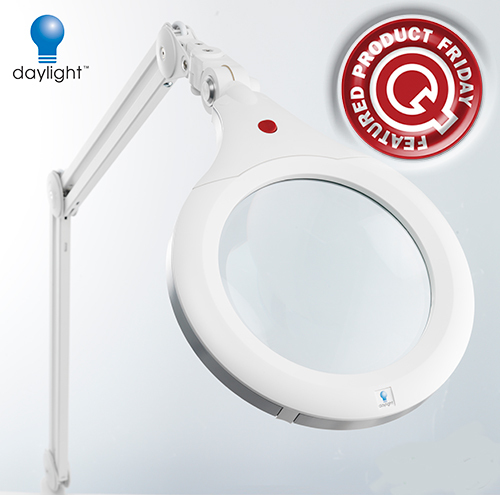 Get the Daylight Company Ultra-Slim White Magnifying Lamp XR w/1.75x Mag. & 7" Lens (Q Source SKU: D070-000004) at 33% off the MSRP when you use our FPF010915 Coupon Code. This Featured Product Friday (FPF) promo is valid from today, January 9, 2015 through Sunday, January 11, 2015. This Daylight Magnifying Lamp (U22080) combines the latest innovations in lighting design and features Daylight’s bright 28W light, XR technology™, Quick Lens Swap System™, and their new Free-Motion head-joint™. Regularly listed at $299.99, but with our FPF code savings you’ll get it for just $200.00. While this is a 3-day limited-time price, the coupon is unlimited. Use the code as many times as you like while it is valid—and please feel free to share the code with your friends and colleagues. For further questions about Featured Product Friday, please read our informational blog post, call us (800-966-6020), or send us an email. Please note: This promo is valid only at QSource.com and expires on January 11, 2015.